How To Be More Authentic At Work | Are You Being Real? Time is our most valuable commodity in this life. From the day we are born until the day we die, we are given 24 hours every day to shape who we become. Where and how we choose to spend our time makes all the difference. If you’re like most people, you spend about 8 hours per day working in a team environment or leading others in their own work – which is likely just as much or more than you spend at home with your family and friends. So if you’re going to spend nearly 50% of your waking hours at work, it’s important that you feel like YOU. 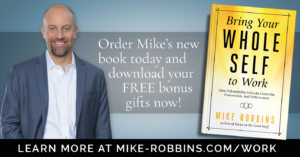 In Mike Robbins’s new book Bring Your Whole Self To Work, he talks about how we can revolutionize our work environment by being more authentic and vulnerable. In my 12 years working in corporate America at Showtime Networks, I spent the first ten toeing the company line being super PC and neutering myself in the process. I can’t say that my coworkers or affiliate clients really knew who I was. Over time, this had an adverse effect on how I felt about myself, what I thought I was capable of, and of course my performance. When I had the courage to more authentically express myself within work, my projects become more creative. I became a better boss because I connected more profoundly with my team and knew how to empower them. At the end of the day, I came home more fulfilled. Take some time and ask yourself this question and answer honestly. Would your coworkers know your answers? Would you know your coworker’s answers? We’re not getting any younger and the importance of both authentic expression & connection are real. Let’s take back our time and live in a space of expression, trust, understanding, relatability, collaboration and teamwork. PS: Pick up a copy of “Bring Your Whole Self To Work” by clicking on the banner below. PPS: I’m mentioned by name in the book twice! 🙂 This is a 1st for me and feels pretty cool because I found and watched Mike’s TEDx talk (The Power of Authenticity) as I prepped for my original authenticity workshop 4 years ago. I never thought I’d even meet him, let alone be mentioned in one of his books!